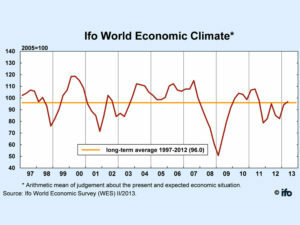 The Ifo World Economic Climate Indicator continued to rise, even if only slightly. Both assessments of the current economic situation and the six-month economic outlook improved marginally compared to the previous quarter. There are a growing number of signs that the world economy is stabilizing. Conducted in co-operation with the International Chamber of Commerce (ICC), the Ifo World Economic Survey (WES) assesses worldwide economic trends by polling transnational and national organizations worldwide on current economic developments in their respective countries. Its results offer a rapid, up-to-date assessment of the economic situation prevailing around the world. In April 2013, 1,178 economic experts in 125 countries were polled. While the economic climate indicator rose only slightly in Western Europe and North America, it increased sharply in Asia. Thanks to much brighter assessments of the economic situation and expectations, the indicator for Asia reached its highest mark since the end of 2010. In North America, assessments of the current economic situation are somewhat better, but remain below the satisfactory mark. The experts surveyed remain positive about the six-month economic outlook, but to a somewhat lesser degree than last quarter. In Western Europe the economic situation remains unfavourable. Economic expectations for the next six months, on the other hand, are slightly more positive, leading to a moderate overall improvement in the economic climate. The results point to the fact that the world economy seems to be falling into step. There might be an increasing trend towards higher growth rates, although business cycle dynamics remain moderate. Monetary policy in advanced economies remains strongly expansionary. Central banks in the US and Japan have announced plans to leave interest rates at their currently low level and to continue to implement quantitative easing measures until the economy stages a clear recovery. In Europe, restricted fiscal policy in many countries is constraining any stronger upswing. In emerging countries, business cycle dynamics look set to gain momentum. World average inflation estimates for 2013 fell somewhat from 3.3% to 3.2%. WES experts on average expect short-term interest rates to remain largely unchanged over the next six months, while long-term interest rates are expected to increase slightly. On worldwide average, economic experts expect moderate increase in the value of the US dollar over the next six months.